Spot on! 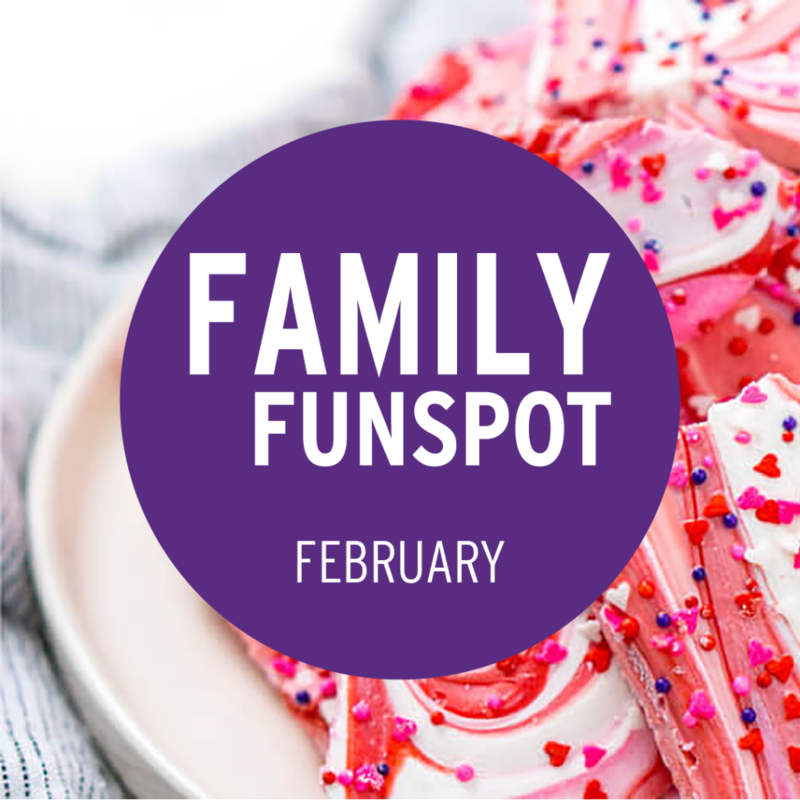 This month we begin our weekly series of cool crafts, delicious recipes, trendy décor ideas and awesome information to make family life more fun! Check back weekly for a new activity. With the winter wind blowing outside, we decided to bring a little of the weather inside for fun. 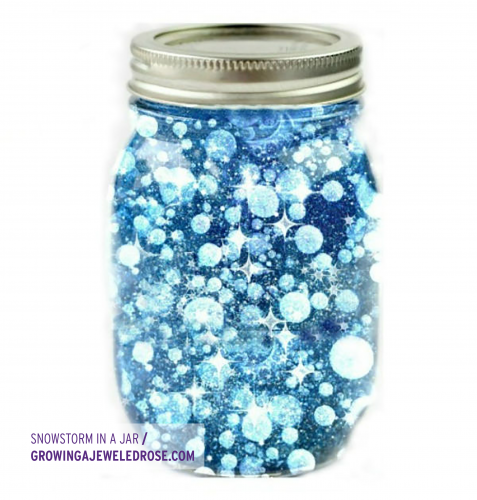 Snowstorm in a Jar is an easy and quick experiment and gives you the opportunity to talk about science and weather. Best of all, it’s likely you already have most of the ingredients needed to make it in your house! We used the Walmart generic version of some ingredients to save money. Up and Up form Target also offers its private label brand as well. *As always, when using glass in an experiment, be sure that you are supervising the activity. The use of baby oil adds a slippery texture to the mix! Mix warm water and white paint together in a separate bowl and stir into a thick and saturated texture, a bit like cake batter. Pour the white water into your jar—about 1/3 of the way full. Gently fill the jar with baby oil, creating a nice layer on top of the white mixture. If you are using glitter for some sparkle, add it next for another layer. Last, break your seltzer tablets into pieces and add them to your jar. Wait and watch as the white paint begins to rise and swirl like a snowstorm! Sometimes you need a dose of color to make February skies a little bit happier! 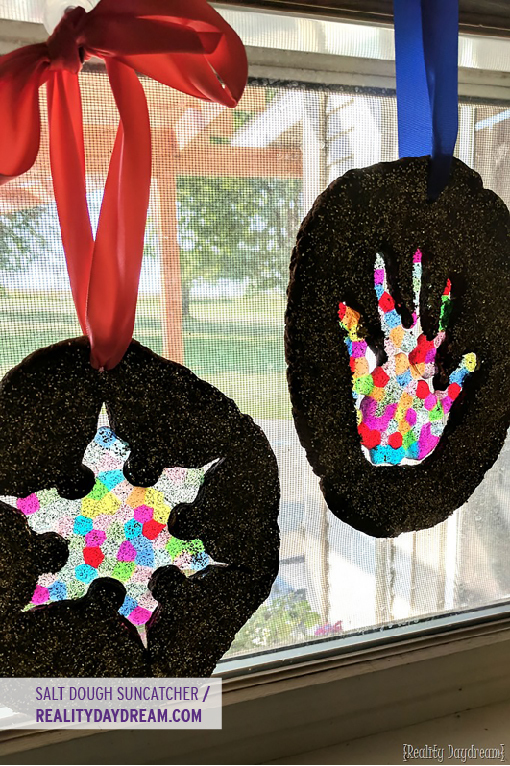 Salt Dough Suncatchers do just that, they take a smidgen of winter light and make it magical! Begin by mixing the flour and salt (dry ingredients) first and then slowly add your water to form a dough. Knead the dough on a floured surface and divide into 2 balls—one for each child. Obviously, if you need dough for 4, simply double the recipe…and so on. If the dough seems sticky add flour—and if it’s too dry add water. Lightly flour a smooth surface and begin rolling our ball of dough into a flat sheet that is about a ¼ inch thick—just like you would with sugar cookie dough. Rolling the ball of dough into a circle shape. Use a cookie cutter to carve out your desired shape. You can also have your child place their hand on the sheet of dough and you can lightly track around it to preserve their handprint. Once they lift their hand, use a table knife to cut around your tracing. Be sure to do this! Next, line your baking sheet or jelly roll pan with parchment paper—you can’t skip this step—so be sure it’s done. The parchment paper keeps the melted plastic beads from sticking to your baking sheet. Lay the piece of dough with the cut-out on the parchment paper. You can also bake the “cut-outs” if you wish. Take the drinking straw and use it to make a hole for hanging the suncatcher. Make sure it’s not too close to the edge or it may break when hung. Next, take the plastic pony beads and place them inside the area left by the cut-out. They will look like cheerios sitting next to one another. You can arrange the colors in any way you choose. Last, place the cookie sheet in the oven, and bake the sun catchers for about 90 minutes to 2 hours. The dough will turn slightly brown, but you need enough time in the oven for the beads to melt into one another and create the stained-glass effect. Let the sun catchers cool thoroughly before adding paint or glitter to cover the baked frame around the melted beads. Let everything dry before threading a ribbon through the hole and hanging them from a suction cup you adhere to the window. 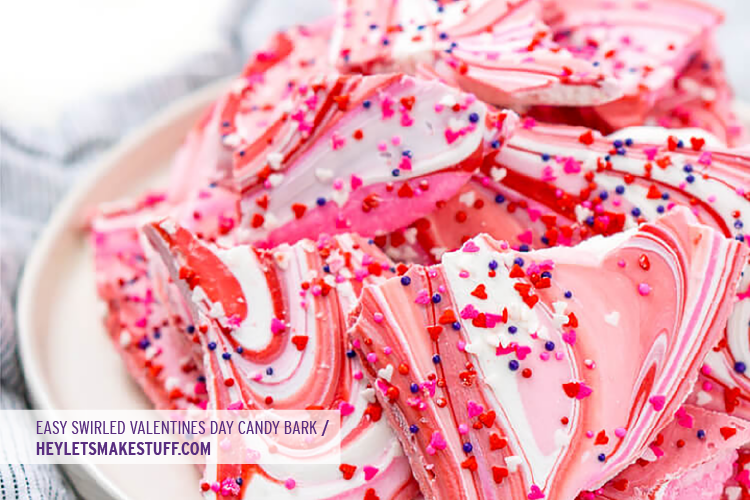 Create some sweet Valentine’s day treats with this simple recipe! Crush or chop your bark ingredients if necessary and place them in separate bowls. Line a cookie sheet or jelly roll pan with a sheet of parchment paper. Melt the candy pieces in a double boiler on low heat, or by using short, I minute microwave session that you stir in between. Pour the melted candy onto the jelly roll pan and let the colors meld into one another. Drop the pieces of pretzel, cookie chunks and candies you have chosen to include on top of the bark. Next, while the mixture is still soft, take a fork and gently move it through the candy to make a marbled effect. Last, add the sprinkles of your choice! Chill and break into pieces! We like placing this treat inside a red paper bag and tying it off with a ribbon for a sweet Valentines treat! Yum! Everyone enjoys a bit of green during the winter months. 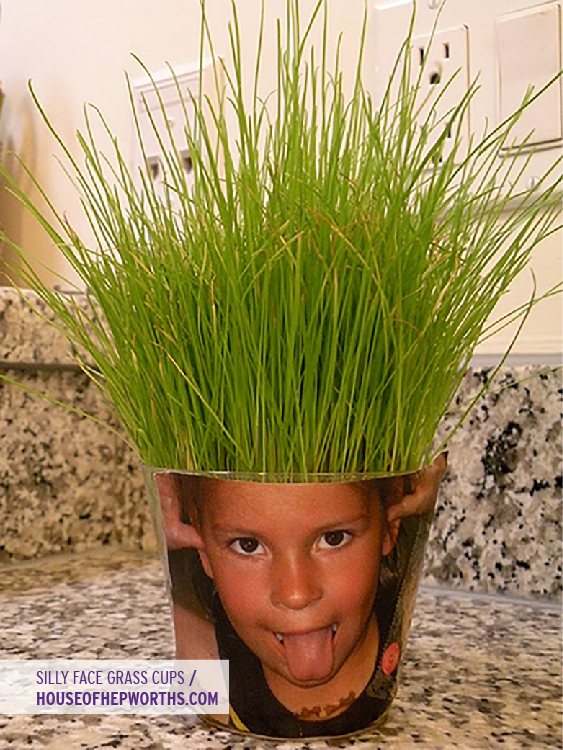 Make February happier with these Silly Face Grass Cups. This is kid-friendly indoor gardening—and it’s very fun and easy! Sit them in a sunny place, like a window sill and wait for the grass to grow!